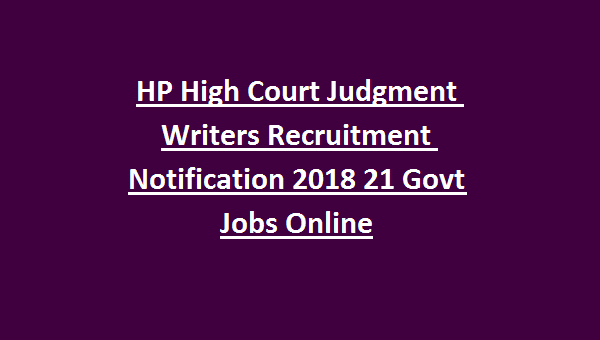 HP High Court Jobs Recruitment 2018: High Court of Himachal Pradesh (HP High Court) invites online application forms from desirous aspirants for filling up the existing/anticipated vacancies of Steno Typist Class III, Judgment Writers Class III on purely contractual basis. As per Notification, total no. of posts is 21. Selected candidates will get the pay scale of Rs.5910/- to Rs.20200/- per month plus Grade pay of Rs.2000/- for above posts. Application mode is online. Last Date to Submit Online Application forms is 21-12-2018. Starting Date to Submit Online Application form is 03-12-2018. 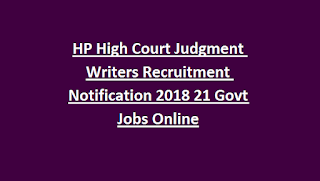 All details of HP High Court Steno Typist, Judgment Writers Recruitment Notification 21 Govt Jobs is mentioned below. As per HP High Court Recruitment 2018, total no. of posts is 21. Qualification should be Graduation degree from a recognized University. Applicants should have the knowledge of typing on computers i.e. 80 W.P.M. in English Stenography; 40 W.P.M. in English language for both for Steno Typist Class III, Judgment Writers Class III posts. Candidates age must not be less than 18 years and not more than 45 years as on 01st January, 2016. Selected candidates will get the pay scale of Rs.5910/- to Rs.20200/- per month plus Grade pay of Rs.2000/- for Steno Typist Class III, Judgment Writers Class III posts. Candidates will be called for Proficiency Test or Interview or Viva-Voce Test for HP High Court Steno Typist, Judgment Writers Recruitment. Candidates shall have to qualify the stenography test with the speed of 80 W.P.M., in English Stenography. Dictation will be given in 5 minutes and candidates have to type the dictation on computer with 40 WPM. Rs.300/- in case of General category candidates or un reserved category candidates; Rs.150/- for reserved category candidates for HP High Court Steno Typist, Judgment Writers Recruitment. HPHC accepts application forms only in online mode. Visit official website of HP High Court i.e. http://hphighcourt.nic.in Fill the form and send before the last date of 21-12-2018. Apply Online here for High Court of HP Jobs.